Coca-Cola is an icon. And as an icon we need to behave like one. So this means being innovative, cool, authentic and a leader. Over the years Coca-Cola has demonstrated this time and time again. However, doing this with a Teen target is another ballgame altogether. Teens don’t want to be sold to, which means we need to insert ourselves naturally into their day as the enabler of the moment rather than the author - by tapping into a behavior that they’re already doing rather than telling them they need to do something different. This is the best way to truly recruit brand advocates instead of in-and-out promo advocates. We all know it isn’t enough to simply appear once a year, even if brands come out with great prizing, it’s just not ownable and rarely does it impact equity. Coca-Cola wants to build a meaningful relationship with this target consumer and to show them who they really are. This case demonstrates Coca-Cola’s success in doing just that. Teens. Is there a more elusive target? Yet they are crucial to the growth of sparkling beverages with the category vying for their attention seemingly at every turn. Making it hard to get noticed and even harder to make a significant connection with them. Over the years Coca-Cola has pushed themselves to offer true value for this target - the most notable example being the ‘Share a Coke’ campaign, which put consumer’s names on bottles and cans for the first time. The program was quite successful and generated a 1.8% increase in buying occasions for 500mL bottles. More than that, it demonstrated the success you can have when you connect with your consumer in an authentic way. As a result, Coca-Cola was keen to build on this momentum and develop a new initiative for the Summer of 2016 that built on its recent achievements and helped recruit a new generation of Teens and of course deliver on aggressive sales targets. A good place to start reaching any consumer base is by taping into their interests. Music is the #1 Teen passion point, it allows them to connect closer with one another and it helps them shape and express their identities. More importantly, music has been and will always be a key influencer on Teens’ behavior and choices. Making it a crowded territory. Moreover, music consumption is shifting with streaming services on the rise and Teens streaming 27,000 hours of music every month. Spotify is now the second biggest revenue-generator for labels. There was an opportunity to use this strategic partnership and build something together that would hopefully leave a lasting impression on the target. The objective was to develop an idea with music at the centre, with the challenge to drive brand love and disrupt in a highly crowded space. Moreover, the client had an aggressive objective of increasing Incidence Growth year over year by +2pts and increasing Favourite Brand amongst Teens by +1.5pts (vs. 2015). There was also a lot of discussion about developing a proprietary app. Would teens want to download Coca-Cola’s app? We believed they would if it truly provided value and a KPI of 25,000 downloads was given to us as an objective. From there we set off to create something truly unique and innovative. a) What new learnings/insights did you uncover? As we stated there’s no disputing the connection between music and our core target, Teens (14-19). However, standing out in this space and truly connecting is another thing altogether. Simply stated, we needed to ensure that Teens remembered Coca-Cola throughout the experience. There is no denying Coca-Cola’s ubiquitous presence in the lives of Teens. We know that music is ever present as well. Simply stated, if we know that music is in one hand and a Coca-Cola beverage is in the other, how could we connect the two in a truly innovative and meaningful way? That was the key that unlocked everything. We didn’t need to give Teens the chance to win a big music experience like a concert or a festival, we simply needed to embrace the existing relationship between target, brand and music. Music and Coca-Cola are naturally a part of summer occasions. From road trips with friends to hanging on the beach, Coca-Cola is often along for the ride. But what if it could play an even bigger part? b) What was your Big Idea? For the first time in the history of the brand, we let consumers not only drink a Coke but also gave them the ability to Play a Coke and became the soundtrack for Summer 2016.
c) How did your Communication strategy evolve? Working with Spotify, we created a way to capitalize on the natural way Teens are consuming music and connect the brand to it in innovative and ownable way. The idea to give every 500mL Coca-Cola its very own playlist was born. From there we looked to extend our reach with Teens and co-created playlists with social media influencers like Superwoman. Our social media influencer's were given their own bottles to showcase amongst their followers. Moreover, we looked to leverage the brand's strategic partnerships with its customers. Coca-Cola's partners served to deepen engagement and awareness as custom playlists were created for McDonald’s, Mac’s /Couch Tard and Landmark cinemas. However, our biggest communication opportunity was the bottle itself. The opportunity to influence the identity of an iconic brand like Coca-Cola is the stuff advertising dreams are made of. Coca-Cola is everywhere and that meant that Play a Coke was everywhere in Canada, all summer long. d) How did you anticipate the communication would achieve the Business Objectives? While the attention span of our target is almost non-existent, we know that they are not impossible to reach. Teens are experimental, innovative and they love to discover new things. We knew if we could leverage these insights, we would have a good chance at achieving our objectives. As stated earlier, Coca-Cola 500 mL bottles were given their own exclusive playlist/soundtrack. We took this initiative one step further and curated the playlists according to mood and occasions. When consumers downloaded the Play-a-Coke app, a Spotify playlist exclusive to that Coca Cola bottle's occassion/mood, played on their phone. Over 180 playlists in English Canada and Quebec were created, giving Teens the ability to save each one of them to their Spotify accounts, making Coca-Cola the soundtrack to their summer. We also made the experience even more interesting by allowing consumers to toggle between songs on the playlist by simply twisting the bottle in their hands. This feature helped ensure that the experience would be fresh and different. a) How, where and when did you execute it? Play a Coke was executed during the Summer of 2016. To say that this program was non traditional is an understatement. The app and the 500 mL bottles were the communication heroes of the program vs. advertising. While ads ran on Spotify and video posts were on social platforms (Twitter and Facebook)and digital pre-roll, the communication was primarily educational. Meaning the messaging was developed to drive awareness but more importantly the ads served as tutorials for the experience. However as stated previously, the crux of the idea was in the packaging itself. We were able to change the look of the label to showcase the program. This along with the custom occassions/moods allowed for disruption at shelf level. Moreover we gave social media influencers their own bottles to help us spread the word and used strategic partnerships to also help drive awareness. Below is a good flow of the experience and shows how it was executed and worked in market. a) How did the work impact attitudes and behaviour? The program has been a great success for the brand. While the promotional campaign drove sales and share, it also managed to aid in the growth of intrinsic attributes like 'Great Tasting' and 'Refreshing' which all drive Coca-Cola's overall brand health. b) What Business Results did the work achieve for the client? The following results were cpatured from the July2nd, Bev360 PE June30th, Coca-Cola Snap App dashboard report. The previous year's summer months were used as a benchmark to determine success. d) What was the campaign’s Return on Investment? Coca-Cola does not share this information. Share a Coke (previous summer's campaign) had a similar spend. Coca-Cola advertises regularly. It can be said that there is always brand momentum. However, the results of this initiative speak for themselves. They contributed to the brand's equity, increased share and incidence. 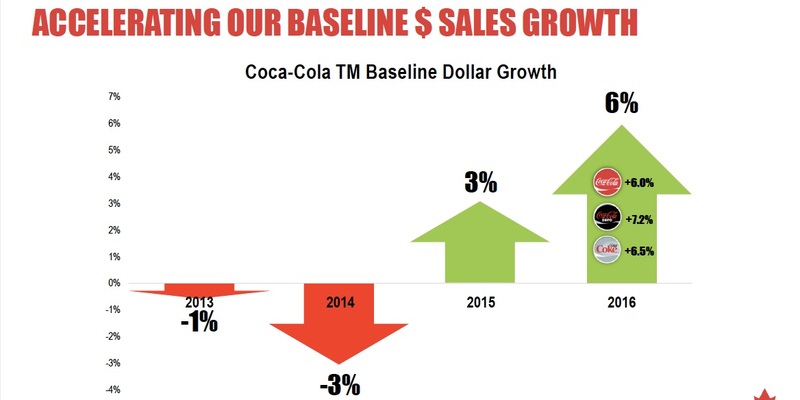 We used the previous period (Summer 2015) to highlight the success of Play a Coke as Coca-Cola would have had similar promotional brand activity in market during last summer as well. The pricing of Coca-Cola did not change during this time.